Running in the Peak District on autumn mornings often means setting off in damp grey conditions. The colder nights combined with the still relatively warm ground can lead to early morning mist and fog, especially in the valleys. However if the atmospheric conditions are right this low cloud can burn off giving fantastic views later in the day. 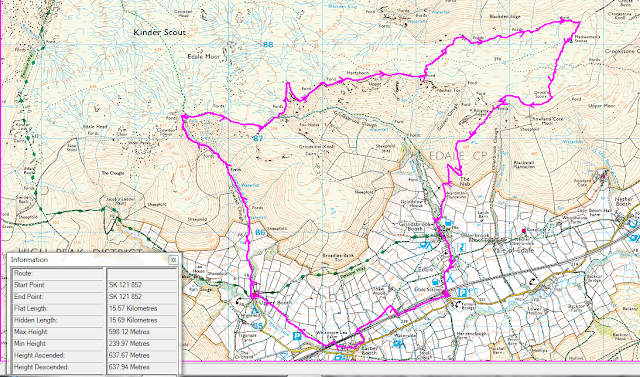 I set off on one such morning for a run around the Burbage and Stanage area. Getting out of the car the air is cold and damp without a breath of wind. Moisture hangs heavy on the branches of the trees, half stripped of their foliage now as November approaches. Visibility is only a few hundred metres but I set off on the familiar path heading south down the Burbage Valley. I must have run in this valley hundreds of times yet I never tire of it, there is always something that catches my eye as the seasons change and the weather, flora and fauna likewise. I make my way down to emerge at the road and cross over, through the trees down to the little footbridge over Burbage Brook. The run seems to have awoken my senses and I notice the smell of damp leaves and hear birdsong, clear in the still morning air. Up the other side and across the road again I now head up to Winyard’s Nick hoping for signs that the fog is lifting as I reach higher ground but the blanket of moist air remains. A heavy dew covers the grass, bracken and rush as I take the familiar route towards Mitchell Field, dropping down through the fields in order to climb again up Callow Bank. I pass a couple of isolated trees which emerge out of the gloom as I approach. I run hard up Callow Bank and as I stop to catch my breath at the top there is a very faint hint that the conditions are brightening. The change in light is barely discernible and at first I think I am imagining it – light headed from my exertion, but it’s real, there is the merest hint of sun in the sky. After crossing the road and taking the path up towards Stanage I stop. The conditions are changing rapidly, visibility is improving and distant features are emerging from the mist. The rocks ahead of me are crisp and clear whilst behind me the fog is fragmenting to reveal some features whilst still cloaking others. In less than 2 minutes the scene has changed dramatically. I head up onto Stanage and run north-west along the edge for a while, enjoying the clearer air and the views to the east whilst the Hope Valley is still under its canopy of fog below me to the west. I would love to run all day but my schedule doesn’t allow and I need to head back. My planned route would drop me down back into the damp blanket of fog so I decide to retrace my steps along the top of the crags in order to remain in the weak autumn sunlight which is now breaking through. Dropping down past the Cowper Stone I pass through some remnants of fog again before emerging into clearer air at Burbage Bridge. The valley below me was in thick cloud an hour ago, now tendrils of mist cling to the flanks of Higger Tor but the sky above is clearing and weak sunshine is reflecting off the puddles and dew on the clumps of rushes. What started as a cold, damp morning has changed and given the promise of a beautiful autumn day and I am glad that I got out early to see the grey skies turn to blue. 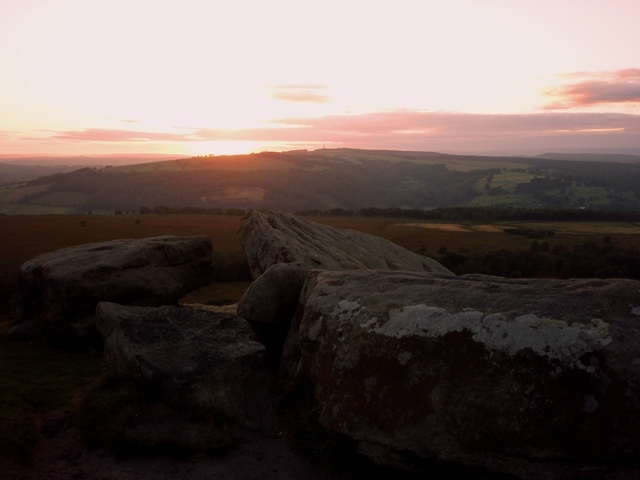 As the nights are drawing in, evening runs in the Peak District are occasionally accompanied by a lovely sunset. I put a small torch in my bum bag so that I can keep running as it gets dark rather than have to stop before it gets dark. 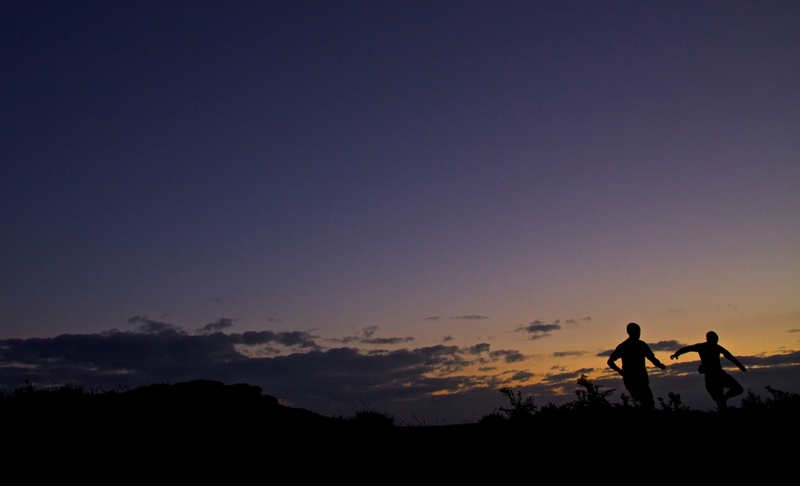 An October evening found me on my usual training ground of the Burbage Valley. Parking at the upper bridge I ran down the main path below the crags before cutting right, down across the stream and working hard on the ascent of Carl Wark. Looking right I see the sun going down behind Higger Tor and notice that the notch of Winyard’s Nick was perfectly aligned as it dropped below the horizon. By the time I crested Carl Wark the sun had already dropped below the horizon leaving hues of pink on the higher clouds and a salmon glow in the western sky. 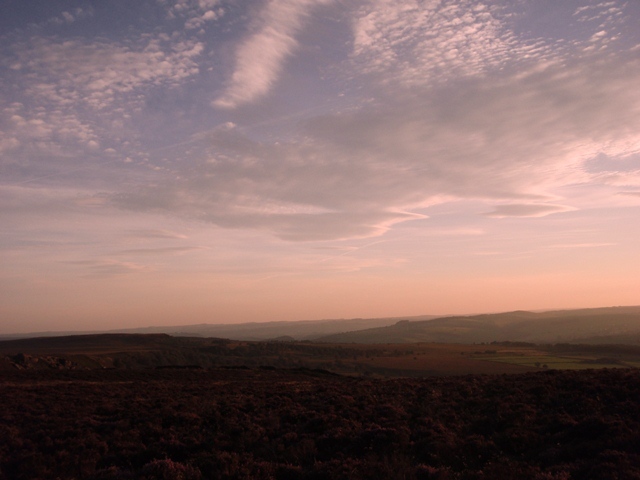 I worked hard on the short climb up Higger Tor and then stopped to appreciate the sunset as the gritstone boulders were silhouetted against the evening sky. I dropped down towards the road crossing to take the path to Toothill Farm, seeing the lights of Hathersage twinkling in the distance and the sun’s afterglow over Mam Tor and the western hills. Dropping down through the fields it became too dark to run in the gloom so I put on my head torch to light the way. In the gathering darkness I crossed the field and turned right to pick up the track that leads up past the derelict building and steepens as it rises Callow Bank. From the I aim to reach the top in 5 minutes and need a few moments to recover at the top before trotting along the road and back to the car park. A lovely evening run with wonderful skies. 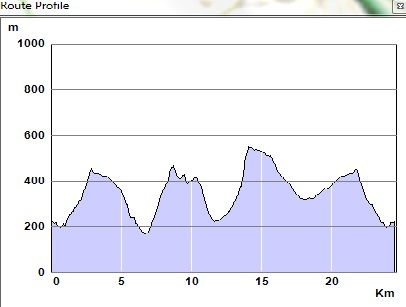 White Edge, high to the east of Grindleford in the Peak District is a lovely location for a run. There are interesting things to discover off the main path and it offers great views across Big Moor towards Sheffield, Chesterfield and westwards across the National Park in the direction of Tideswell. 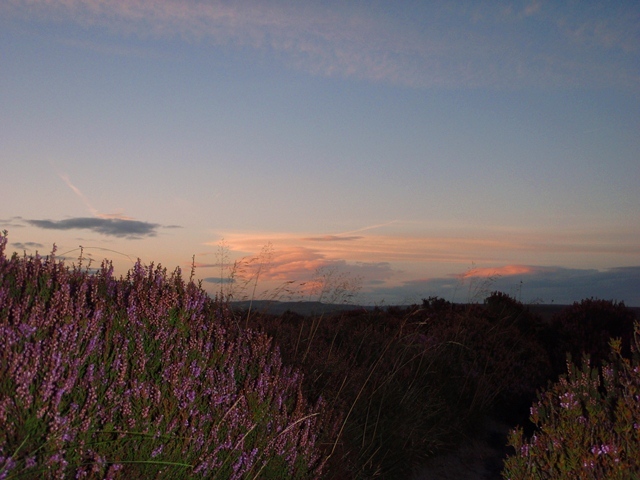 This westerly aspect makes it ideal for an evening run when broken high cloud offers the prospect of a fine sunset and the orange rays enhance the purple of the heather. Starting at the junction of the A625 and B6054 I head up onto the moor and my first intention is to visit Lady’s Cross which is marked on the Ordnance Survey map off to the east. It is easy to find as it stands less that 100m off the path. 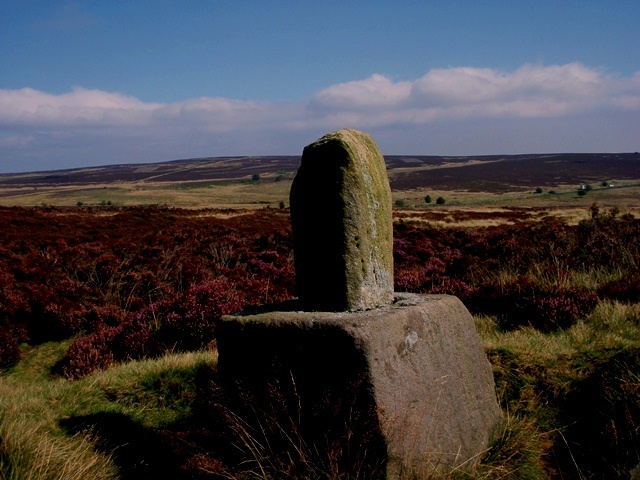 The ancient crossroads and boundary marker, although no longer having its cross piece it is well preserved. 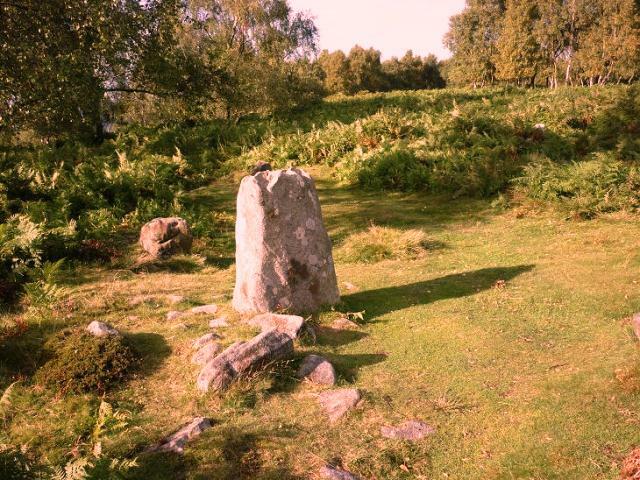 My next destination is the Hurkling Stone and cairn marked about 800m to the south. Navigation is easy by first finding the old wall and following it southwards to its corner. Here I find a large boulder but no evidence of a cairn. 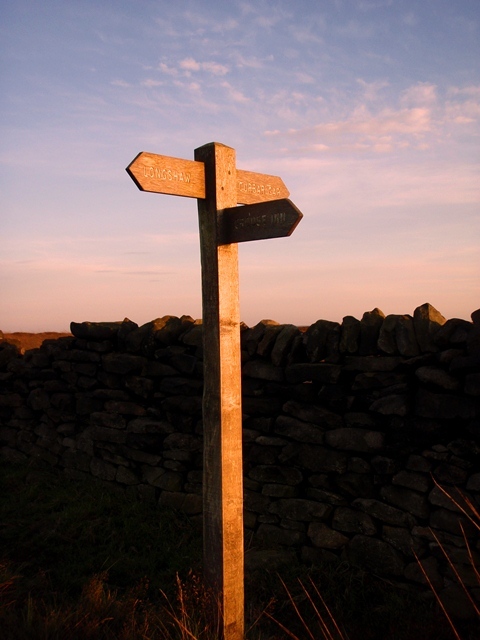 Returning to the main path I pass the fingerpost and drop down, steeply a first to cross the road at the Grouse Inn and cross the fields into the woods. Passing by the parking I dip down to cross the stream and startle a hind which bounds away and is gone before I can fumble for the camera. Steeply up the other side and crossing the road again to the path leading south along Froggatt Edge I pass climbers walking back after a day on the crags. Through the Birch woodland I am heading for Stoke Flat stone circle tucked just to the left of the path. In late summer the bracken is high and hides the stones from view but after a little exploring I emerge into the clear space of the circle. I wonder about the significance and history of these Bronze Age artefacts: who erected them and what was their life like? Rather than take the main path along the crag top I opt to cross the centre of the moor, heading south eastwards below White Edge and after a couple of minutes of rough ground I pick up a good path. I pass a small sheepfold and glance up and left looking for the trig point that is my next stop. The light is starting to fade as I reach it with the sun now only just above the horizon. 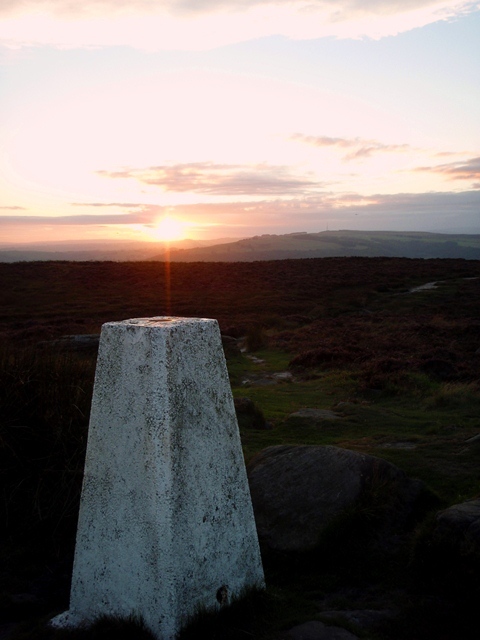 The last of the sun on White Edge trig. After savouring the views for a few minutes I turn northwards, passing by gritsone boulders, the few clouds tinted salmon pink by the lowering sun dropping below Sir William Hill. I take a last look at the sky before picking up the pace, heading north along the good path which undulates along the edge. 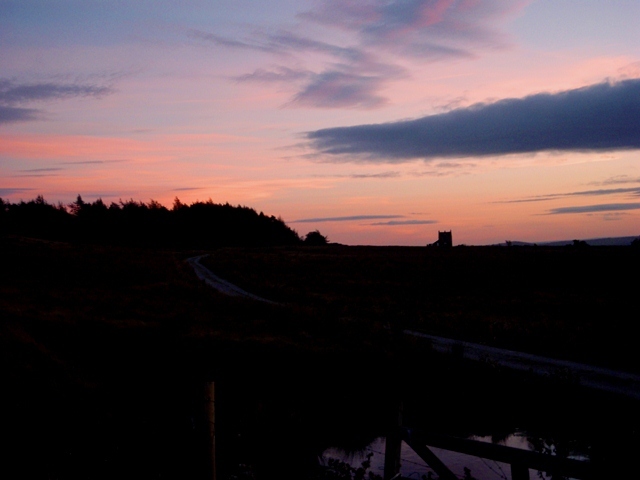 I make it back to the car in the afterglow of sunset and take a final look, the lodge house silhouetted against a pastel sky. Another lovely run completed, I head for home. 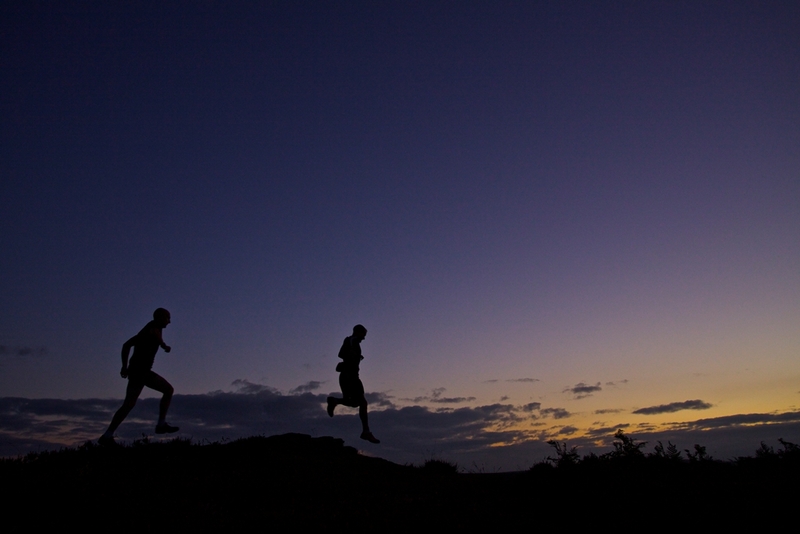 The nights are drawing in but recent good weather has given a great opportunity for evening running in wonderful conditions. Grabbing the opportunity to squeeze in a late evening run I picked up my mate Matt and headed out to the nearest part of the Peak District for a twilight run. The sun was setting by the time we set off but there was just enough light to run without torches for 20 minutes or so. The light was fantastic, salmon pink in the west and a deep indigo to the east above the city lights starting to shimmer in the distance. We picked our way through the heather visiting the Ox Stones, eyes gradually adjusting to the increasing darkness before we finally had to put our our head torches. Running past the trees of Lady Canning’s plantation, bats flitted about overhead catching our peripheral vision but changing direction too quickly in the gloom for us to get a proper look. Running through the woods we lost the last of the light and were totally reliant on our torches to pick out the terrain ahead although the clear path didn’t present too many obstacles and we were able to maintain a reasonable pace. 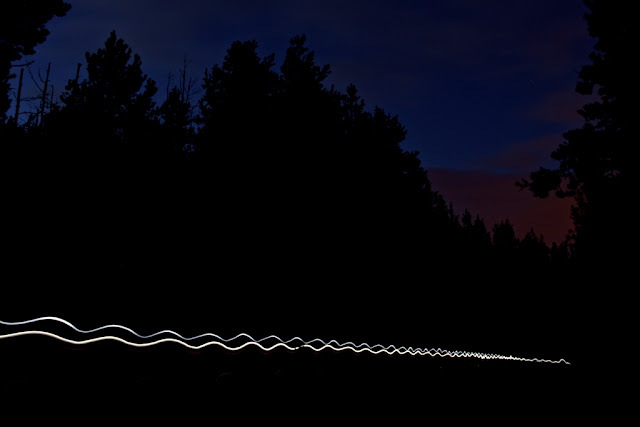 The beauty of night running is that it forces to slow down and become more in tune with your senses, your awareness heightened compared to running in daylight. The running becomes easier now as the path follows the plateau edge, firm and sandy with large flagstones laid in sections to prevent erosion. I can take in more of the view now and soak up the vistas as I progress eastwards, the steep sided Grindsbrook Clough, the rocky Ringing Rodger further ahead and way across the valley the twins of Lose and Win Hill looking small from this lofty setting. 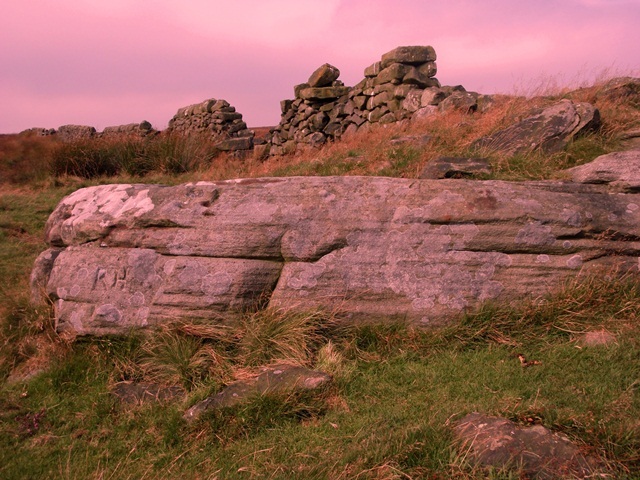 Hundreds of thousands of years of wind and rain have shaped the gritstone outcrops into strange shapes, nature’s own sculpture park . Running eastwards I pass Madwoman’s Stones, wondering about the story that must be behind their odd name, and swing round southwards to cross the head of Jagger’s Clough. The sky is cloudier now and sunbeams break through as I reach the Druid’s Stone, again the name conjuring thoughts of the history behind the name. I pause one last time to look back to where I stood earlier, taking in the view up the steep valley of Grindsbrook reaching westwards onto Kinder. 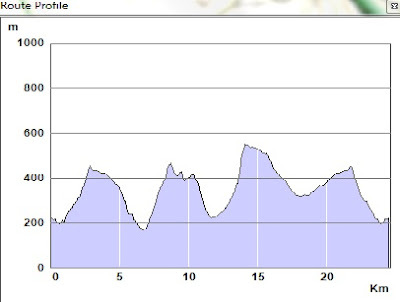 Then its down to the fields and onto the road back to the start, happily tired. My favourite running area is the Burbage Valley, close to Hathersage in the Peak District. It is only 10km from the city centre yet gives the feel of being rugged and remote, especially if you can avoid the weekend crowds. 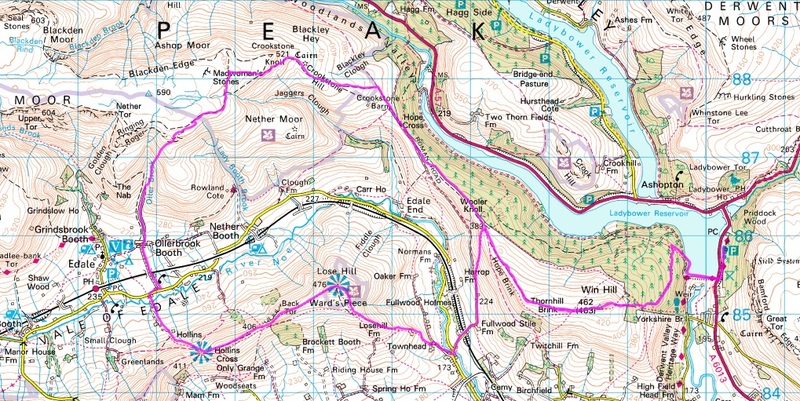 There is plenty of parking at the top and bottom of the valley and a choice of terrain to run on including trail, fell and steep hill. It has everything an off road runner needs and if you park at the Fox House you can reward your efforts with a little “liquid refreshment” afterwards. I took advantage a brief gap in the wet summer weather to enjoy an evening run around “Burbage”. Starting from the car park at Burbage North I take the upper path above the crags, heading southwards. Recent heavy rain had made the ground wet and boggy and it is a case of dodging puddles and looking for the driest line. After a couple of kilometres a stream makes a natural break in the rocky outcrops separating the north and south sections of the valley and I drop down its side to pick up the lower track. 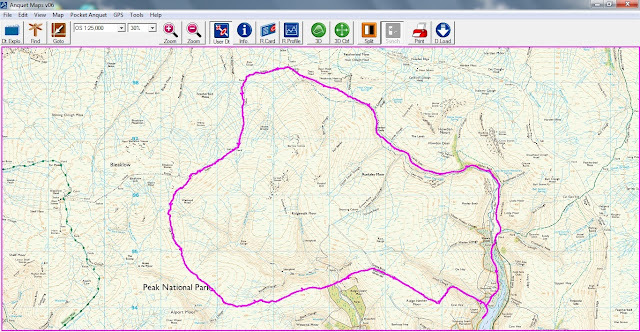 This has been recently improved and makes for faster more even trail running in contrast to the higher path which is more fell running terrain. Continuing southwards I look across the valley on my right and see the 2 summits of Carl Wark and Higger Tor under a threatening sky, maybe I won’t escape a drenching after all. 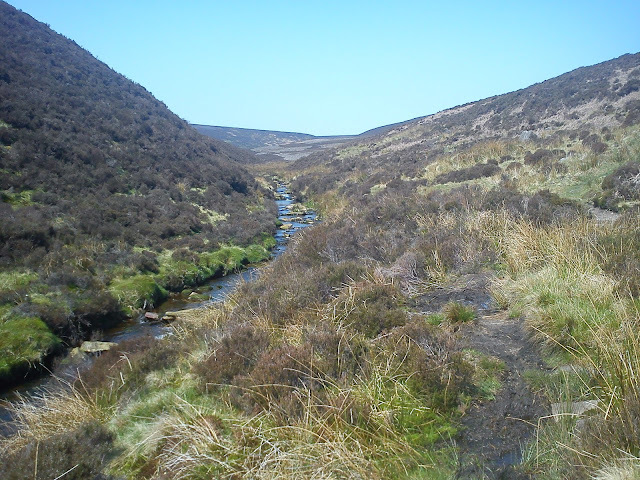 I could continue to follow the track down to the road and on towards Padley Gorge but I decide to cut right towards Carl Wark on a grassy path and cross the stream by a tricky leap across some rocks. Sometimes this is a simple stride but occasionally after heavy rain it is more a leap of faith! I then climb up through a boggy patch (wet feet again despite it being mid summer) to the ancient hill fort of Carl Wark. It fascinates me to think that this flat topped hill with its natural defences was occupied around 4000 years ago! 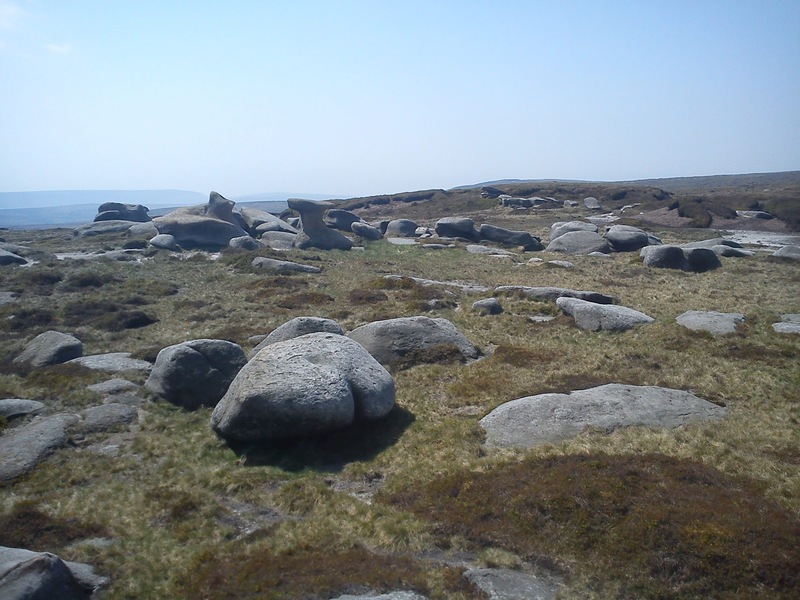 A quick trot across the flat, boulder studded plateau and then a short, steep drop before climbing again to Higger Tor and its fantastic views. I pause to look over at the route I’ve taken and gaze at the towering cotton wool clouds, pure brilliant white from afar but dark and threatening at close quarters with the threat of further rain. Racing the gathering clouds I press onwards now on the final leg towards Burbage Bridge where the brook passes under the road in 2 sturdy tunnels. I take a quick peek into one before it’s back to the car, pleased to have avoided the rain.